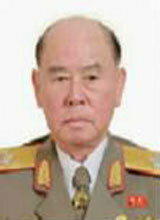 N. Korean Gen. Ri Myong Soo called first in 70th anniversary. September. 11, 2018 07:46. by In-Chan Hwang hic@donga.com. The former chief of the Korean People’s Army’s Gen. Ri Myong Soo, 84, who was rumored to have been replaced in April after being caught dozing off while Kim Jong Un was giving a speech, was referred to as "the highest rank in the military" in reports about the 70th anniversary of North Korea's founding. North Korea’s Korean Central Television on Monday introduced the participants of North Korea’s foundation day celebrations held a day earlier, by saying, “Responsible workers of our armed forces, including comrades Ri Myong Soo, Kim Su Gil, Ri Yong Gil, and No Kwang Chol, provincial chairmen, and military and social workers came out on the balcony of Grand People’s House,” mentioning Ri Myong Soo earlier than the top three ranks in the army. Ri Myong Soo was caught nodding off during Kim Jong Un’s speech at the third plenary meeting of the Central Committee of the Workers’ Party of Korea. Ri gave a military salute to South Korean President Moon Jae-in at the April 27 inter-Korean summit. A North Korean source said the reason why Ri was mentioned first among military officials is not because he has the power but to respect an elder military official.